Robert Maurice Farring Jr. was born September 9, 1897, in Brooklyn, Brooklyn Twp., Anne Arundel Co., MD, and died July 23, 1977, in Prineville, Powell Butte, Crook Co., OR, at age 79. Buried in Juniper Haven Cemetery, Prineville, Crook Co., OR. He is the son of Robert Maurice Farring Sr. of Maryland, and Alice A. Stansbury, of Maryland. Robert had a twin brother, George Wiley Farring. Hazel Marguerite Nelson was born October 30, 1902, in Rockford, Winnebago Co., IL, and died January 30, 1999, in Prineville, Powell Butte, Crook Co., OR, at age 96. Buried in Juniper Haven Cemetery, Prineville, Crook Co., OR. 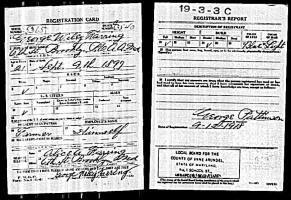 She is the daughter of Clarence Cornelius Nelson of Rockford, Winnebago Co., IL, and Edith Christina Larson of Farmington Twp., Waupaca Co., WI. Robert Maurice Farring Jr. and Hazel Marguerite Nelson were married on December 25, 1931, in Detroit, Wayne Co., MI. Alice Clarissa Farring: Born October 16, 1932, in Detroit, Wayne Co., MI. Never married. Robert Maurice "Bob" Farring III: Born March 25, 1934, in Detroit, Wayne Co., MI. Future grave in Hunter Cemetery, Hunter, Cass Co., ND. Engaged January, 1956, in Oregon, to Elinor Lehman: Born about 1933 in Wisconsin. This engagement may have been called off. Married December 8, 1956, in Unknown, to Ruth Ann Burchill: Born September 16, 1935, in Cass Co., ND. Future grave in Hunter Cemetery, Hunter, Cass Co., ND. Ruth's parents and her brother are also buried there. Samuel Nelson "Sam" Farring: Born August 11,1935, in Detroit, Wayne Co., MI. Married to Janice Colleen Tyson: Born September 24, 1950, in Unknown. Rose Marilyn Farring: Born October 12, 1937, in Detroit, Wayne Co., MI. Never married. David Norman Farring: Born 1942 in Detroit, Wayne Co., MI. Married to Elrena Louise Bullock: Born 1945. 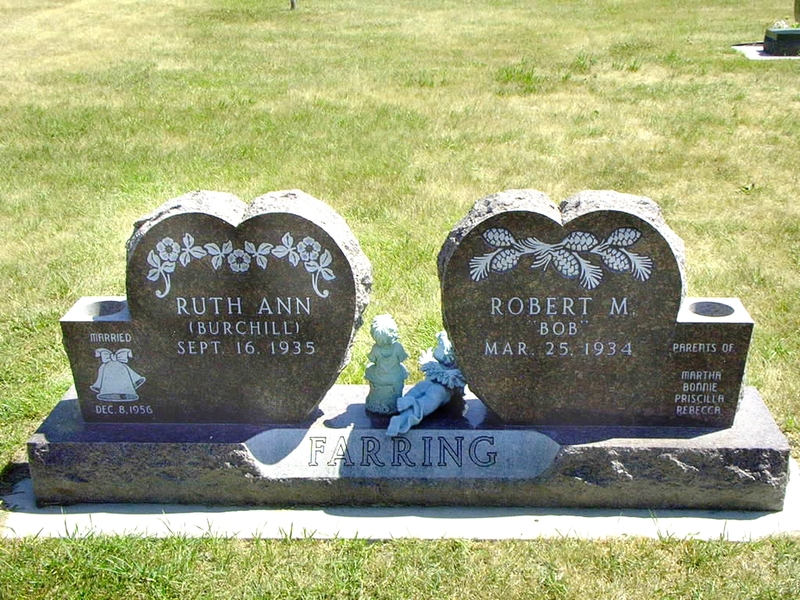 Robert Maurice Farring Jr. and Hazel Marguerite (Nelson) Farring are buried in Juniper Haven Cemetery, Prineville, Crook Co., OR. Thanks to Find-A-Grave for making this image available. Robert Maurice "Bob" Farring III and Ruth Ann (Burchill) Farring will be buried in Hunter Cemetery, Hunter, Cass Co., ND. Thanks to Find-A-Grave for making this image available. Robert Maurice Farring Jr. was born September 9, 1897, in Brooklyn, Brooklyn Twp., Anne Arundel Co., MD. 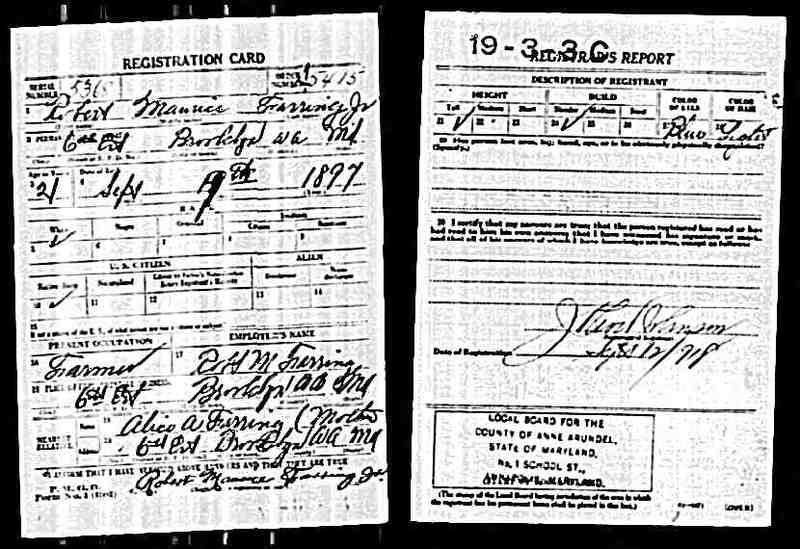 The 1900 U. S. Census taken on June 27, 1900, shows Robert M. Farring (age 34) born September 1865 in Maryland to German-born parents is a School Teacher owning his own home with a mortgage and living on Patapsco Avenue, Brooklyn, Brooklyn Twp., Anne Arundel Co., MD. Living with him is his wife of seven years, Alice A. Farring (age 27) born September 1872 in Maryland to Maryland-born parents, with all 4 of the children born to her still alive. Also living there are his four children, all born in Maryland to Maryland-born parents: Mary P. Farriing (age 6) born August 1893; James L. Farring (age 4) born October 1895; Robert M. Farring (age 2) born September 1897; and George W. Farring (age 2) born September 1897. Also living there is Daisy Williams (age 16), an unmarried Black Servant. Hazel Marguerite Nelson was born August 29, 1901, in Rockford, Winnebago Co., IL. The 1910 U. S. Census taken on May 3, 1910, shows Clarence C. Nelson (age 31) born in Illinois to Swedish-born parents is a general farmer owning his farm in Dixon Twp., Gregory Co., SD and has been married 10 years. Living with him is his wife, Edith C. Nelson (age 27) born in Wisconsin to Swedish-born parents, and has all five of the children born to her still alive. Also living there are their children: Myrtle C. Nelson (age 8) born in Illinois; Hazel M. Nelson (age 7) born in Illinois; Paul E. Nelson (age 5) born in Illinois; Fern E. Nelson (age 2) born in South Dakota; and Olive S. Nelson (age 1/12) born in South Dakota. 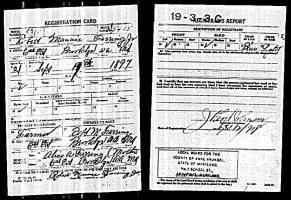 The 1910 U. S. Census taken on April 20, 1910, shows Robert M. Farring (age 44) born in Maryland to German-born parents is a Post Office Clerk owning his own home free of a mortgage and living at 408 Annapolis Avenue, Brooklyn, Brooklyn Twp., Anne Arundel Co., MD. Living with him is his wife of 17 years, Alice A. Farring (age 37) born in Maryland to Maryland-born parents, with all 5 of the children born to her still alive. Also living there are his five unmarried children, all born in Maryland to Maryland-born parents: Mary P. Farriing (age 16); James L. Farring (age 14); Robert M. Farring, Jr. (age 12); George W. Farring (age 12); and Milton R. Farring (age 4/12). The 1930 U. S. Census taken on April 3, 1930, shows Robert Ferring (age 64) born in Maryland to German-born parents and first married at age 27 is an Auto Accessories Bookkeeper owning his own home valued at $1,900 and living at 412 Patapsco Avenue, Baltimore, Baltimore Co., MD. Living with him is his wife, Emma Ferring (age 61) born in Maryland to Maryland-born parents and first married at age 53. Also living there is his unmarried son, Richmond Ferring (age 20) born in Maryland to Maryland-born parents, who is a Coast Guard Ship Carpenter Helper. 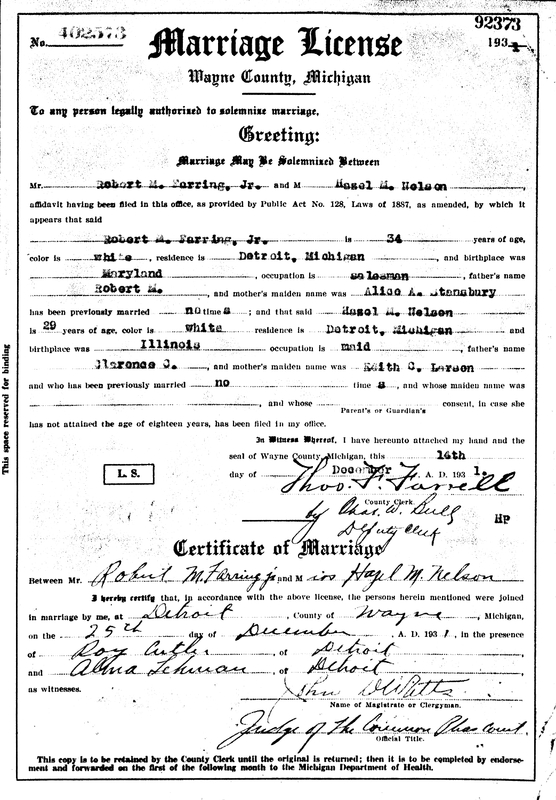 Robert Maurice Farring Jr. and Hazel Marguerite Nelson Marriage Record. 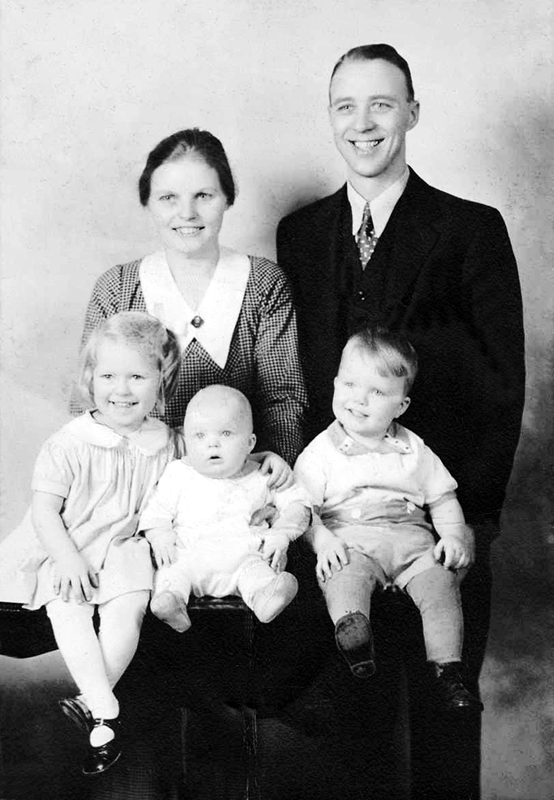 Robert Maurice Farring Jr. and Hazel Marguerite (Nelson) Farring, with children Alice Clarissa Farring, Robert Maurice "Bob" Farring III, and Samuel Nelson "Sam" Farring, Joy Road, Detroit, Wayne Co., MI, January 3, 1936. The 1940 U. S. Census taken on April 24, 1940, shows Robert Farring (age 42) born in Maryland, and 5 years ago was living in the Same Place, and with 7 years of School, and who owns his home worth $2,500 is a married Clerk Typist for Automotive, and is living at 19329 , Red Points, Redford Twp., Wayne Co., MI. Living with him are: his wife, Hazel M. Farring (age 37) born in Illinois, and 5 years ago was living in the Same Place, and with 1 year of High School; his daughter, Alice Farring (age 7) born in Michigan, and 5 years ago was living in the Same Place, and with 1 year of School; his son, Robert M. Farring (age 6) born in Michigan, and 5 years ago was living in the Same Place; his son, Samuel N. Farring (age 4) born in Michigan; and his daughter, Rose Marilyn Farring (age 2) born in Michigan. Robert Maurice "Bob" Farring III and Elinor Lehman were engaged January, 1956, in Oregon. The marriage may not have taken place. ENGAGED - Mr. and Mrs. Arnold Lehman, Route 5, Menomonie, announce the engagement of their daughter, Elinor, to Robert M. Farring Jr., son of Mr. and Mrs. Robert M. Farring Sr., Tacolt, Wash. Miss Lehmann is a graduate of Stout State College, Menomonie, and is now a staff dietitian at Good Samaritan Hospital, Portland, Ore. Her fiance is attending Clark College in Vancouver, Wash. A late summer wedding is being planned. 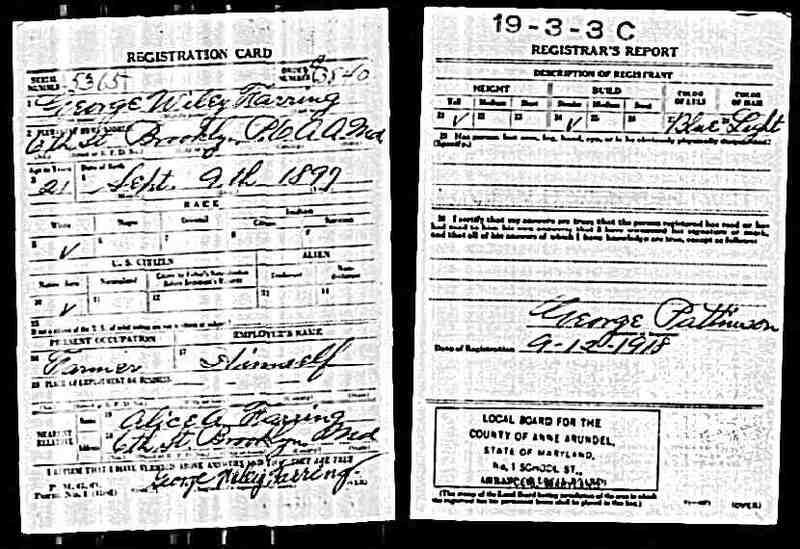 Leigh Larson note: Arnold Clarence Lehman was born August 21, 1906, in Weston, Dunn Co., WI, and died December 31, 1962, in Dunn Co., WI, at age 56. Buried in Lower Weston Cemetery, WEston, Dunn Co., WI. Elinor A. Lehmanwas born about 1933 in Salem Twp., Pierce Co., WI. Robert Maurice "Bob" Farring III and Ruth Ann Burchill were married December 8, 1956, in Unknown. Robert Maurice Farring Jr. died July 23, 1977, in Prineville, Powell Butte, Crook Co., OR, at age 79. Buried in Juniper Haven Cemetery, Prineville, Crook Co., OR. Hazel Marguerite (Nelson) Farring died January 30, 1999, in Prineville, Powell Butte, Crook Co., OR, at age 96. Buried in Juniper Haven Cemetery, Prineville, Crook Co., OR. Matthew Steenhout, 18, Jamestown, N.D., died Saturday, Feb. 17, 2007, in the Anne Carlsen Center for Children, Jamestown. Mr. Steenhout was born Aug. 31, 1988, in Portland, Ore. He moved with his family to Loudoun County, Va., when he was 9 months old. In 1998, he entered the Anne Carlsen Center for Children. He loved music. He is survived by his parents, Rebecca Wallace, Moorhead, and Steven Steenhout, Anchorage, Alaska; a brother, Timothy Steenhout, Moorhead; two sisters, Emily Steenhout, Isabelle Wallace, both Moorhead; his grandparents, Bob and Ruth Farring, Fargo, Willard and Shirley Steenhout, Idabel, Okla.
Visitation: Tuesday from 9:30 to 10:30 in Calvary United Methodist Church, Fargo. Funeral: Tuesday at 10:30 in the church. Burial: Tuesday at 3 in Hunter (N.D.) Cemetery.